Mathias received a non-roster invitation to Indians' spring training on Friday. Mathias spent the last two years at Double-A Akron and posted a .232/.338/.370 slash line in 117 games during 2018. 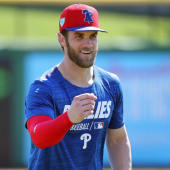 The 24-year-old is an extreme longshot to make the major-league roster given his limited success at Double-A, as he seems likely to spend the 2019 season establishing his footing at Triple-A.